As a successor to the fastest car of 2005, McLaren have developed the MP4-21 for 2006 which proved a bit less competitive. 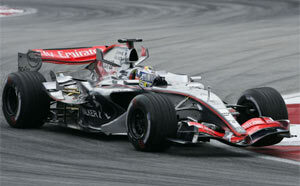 The MP4-21 looks very similar to the McLaren MP4-20. In addition to the tighter packaging to the rear of the car, the nose has been lowered and made narrower. The reduction in required cooling for the V8 engine has allowed to reduce the size of air intakes, this includes apertures in the main chassis, which is beneficial to the overall aerodynamic package. There are a significant number of changes in the cars structure, geometry and aerodynamics as a consequence of 16 months of R&D innovation. The new car consists of 11,500 components, 90% of which have changed from MP4-20. Construction: McLaren moulded carbon fibre/aluminium honeycomb composite incorporating front and side impact structures. Contains integral safety fuel cell. Front suspension: Inboard torsion bar/damper system operated by pushrod and bell crank with a double wishbone arrangement. Electronics: McLaren Electronic Systems control units incorporating electronics for chassis, engine and data acquisition. McLaren Electronic Systems also supplies the electronic dash board, alternator voltage control, sensors, data analysis and telemetry systems.